House the ESX-8MD in a Eurorack case of your choosing. The power connector is Doepfer standard. If using the power cable supplied with the ESX-8MD, the red edge of the cable is nearest the bottom of the PCB, and carries -12V. ("-12V" is marked on the PCB itself next to this end of the connector.) Be sure to connect the other end of the power cable correctly, again so -12V corresponds to the red stripe on the cable. 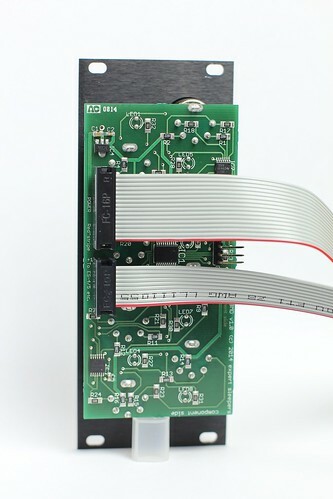 The ESX-8MD also needs to be connected to an ES-4, ES-40 or ES-5 module. A 10-way cable is supplied with the ESX-8MD. With this cable fitted as shown above, the red strip should be oriented at the other end as shown in the photos in the ES-4 and ES-5 user manuals.